The Dark Energy Survey (DES) is an international, collaborative effort to map hundreds of millions of galaxies, detect thousands of supernovae, and find patterns of cosmic structure that will reveal the nature of the mysterious dark energy that is accelerating the expansion of our Universe. DES began searching the Southern skies on August 31, 2013. According to Einstein's theory of General Relativity, gravity should lead to a slowing of the cosmic expansion. Yet, in 1998, two teams of astronomers studying distant supernovae made the remarkable discovery that the expansion of the universe is speeding up. To explain cosmic acceleration, cosmologists are faced with two possibilities: either 70% of the universe exists in an exotic form, now called dark energy, that exhibits a gravitational force opposite to the attractive gravity of ordinary matter, or General Relativity must be replaced by a new theory of gravity on cosmic scales. 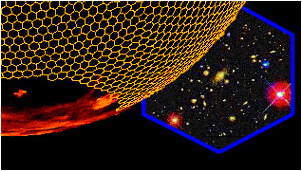 DES is designed to probe the origin of the accelerating universe and help uncover the nature of dark energy by measuring the 14-billion-year history of cosmic expansion with high precision. More than 400 scientists from over 25 institutions in the United States, Spain, the United Kingdom, Brazil, Germany, Switzerland, and Australia are working on the project. The collaboration built and is using an extremely sensitive 570-Megapixel digital camera, DECam, mounted on the Blanco 4-meter telescope at Cerro Tololo Inter-American Observatory, high in the Chilean Andes, to carry out the project. Over five years (2013-2018), the DES collaboration is using 525 nights of observation to carry out a deep, wide-area survey to record information from 300 million galaxies that are billions of light-years from Earth. The survey is imaging 5000 square degrees of the southern sky, with 3400 sq-degrees overlapping the Sunyaev-Zel'dovich CMB surveys conducted by SPT, in five optical filters to obtain detailed information about each galaxy. A fraction of the survey time is used to observe smaller patches of sky roughly once a week to discover and study thousands of supernovae and other astrophysical transients. PhD Thesis Defense, Ross Cawthon, "Effects of Redshift Uncertainty on Cross-Correlations of CMB Lensing and Galaxy Surveys"
PhD Thesis Defense, Alan Zablocki, "Constraining Neutrinos and Dark Energy with the Angular Clustering of Galaxies in the Dark Energy Survey"